Cook the linguine in salted water, per instructions. Drain pasta. Reserve 1¼ cups of cooking water. 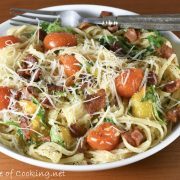 While the pasta is cooking, cook the bacon pieces in a large skillet over medium heat until golden brown and crisp. Remove the bacon crumbles from the pan with a slotted spoon and place on a paper towel; set aside. While the bacon is cooking, combine the beaten eggs with the Parmesan cheese, lemon zest, sea salt and freshly cracked pepper, to taste in a small bowl; mix well. Set aside. Slowly whisk in 1 cup of cooking water; set aside. Remove all but 2 tablespoons of bacon grease from the skillet then add the shallot and tomatoes. Cook, stirring often for 3 minutes. Add the crushed red pepper flakes and minced garlic then cook, stirring constantly, for 1 minute. Reduce heat to medium low; add the drained & cooked linguine and toss well. Slowly add the egg mixture; tossing to make a creamy sauce, about 1 minute. Add the bacon crumbles, baby spinach, and arugula then season with sea salt and freshly cracked pepper, to taste. Add more reserved cooking water to loosen pasta, if needed. Serve topped with freshly grated parmesan. Enjoy.